A baby’s life saved, instead of aborted! I’ve written quite a few posts on abortion. It is a subject I am very passionate about, but not for the sake of being passionate. But because it is on the heart of the Father. You can read this post. I’ve written about Rowan, the 22 week old baby that was aborted, but born ALIVE. And then neglected by the abortion clinic personnel and then died. The article is on the right hand side of my blog if you haven’t read about it. Check it out. I read another blog tonight that compared two stories. The story of a similar case as Rowans. And then a HAPPY LIFE STORY, of someone who DID NOT ABORT THEIR BABY but considered their life so precious that they SAVED his life by performing surgery INSIDE the womb at 21 weeks!!!! Then closing it back up where he continued to live, and then was birthed a healthy baby! I don’t understand how you could deny that a “fetus” in the womb is a child! Help us Lord! Break in with LIFE in our culture of Death! Sign this petition to help fight against this Act!!!!! Here is the promo video for this movie. 22 weeks. I wrote about it in a couple of posts. It is now out on video. You can buy the DVD HERE! If you don’t have a clue what I’m talking about read this article! We have got to pray for our nation and our President for righteousness and justice to reign! That we would stop murdering our children! Read this post to find out the new laws that our President wants to past to make ALL types of Abortions legal!!!! Help us Jesus!! End Abortion and send REVIVAL to America! Our Bound4Life here in Central North Carolina has put out some information on their blog about the upcoming abortion laws that could be put into effect. Check out this website that talks about the information as well. We really need to pray for our new president and the decisions that he is going to be making! Lord break in! Have mercy on our land, give our government leaders a spirit of wisdom and revelation about Your Son! Let righteousness and justice reign! Save the babies that are being murdered! Open up the eyes of the people to see the blood that is in our land! My friend and roommate, Carol, who I’ve blogged about before and put up pictures, turned the big 20 today! 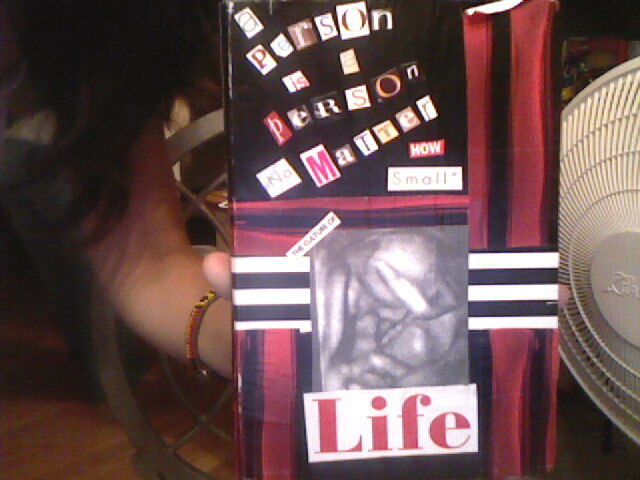 For her present I did one of my new favorite hobbies, I made her a journal. Or actually I designed her a new cover for her old one. And what is her passion? Praying for the ending of Abortion and a culture of life in America. She is head of our Bound4life Central North Carolina. Here is the finished cover! The baby on the front is Isabella Grace, my friend Tiffany’s baby. This was when she was 16 weeks in the womb. She is still in the womb, yet to be born. But she is coming soon!